All fields are mandatory except for the Comments field. The Contact Name field is normally reserved for your directory administrator, but it may be any individual in your organization. If someone requests a Login to your directory, the request will be routed to the Email address listed on this screen. Therefore, the contact name and the email address should be for the same person. The address information is normally for the organization. The Home Page field is if the user first has a web site and secondly allows the administrator the change the address of the web site. This might happen if the organization changes the "hosting" company on the Internet. The "Show Organizations Menu Option" radio buttons determines whether the Organizations menu option appears for your organization. If you check yes, the Organizations menu option will appear for your organization. If you check no, the Organizations Menu Option will not be shown. Note:If you have a login to multiple organizations the organizations menu option will appear unless your primary organization "Show Organizations Menu Option" is set to "NO". The "Public Can View My Organization" radio buttons allows or disallows an individual to see the name of your organization listed when a search is done for a list of the directories. If you check yes, the name of your directory will be listed when a search is done. If you check no, your directory will not be listed when a search is done. 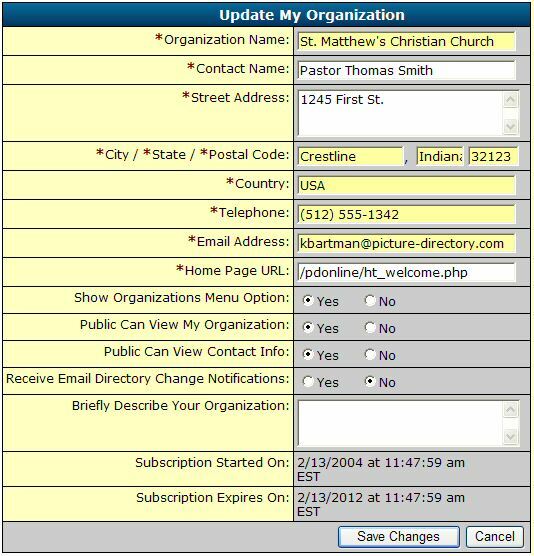 The "Public Can View Contact Info" radio button allows/disallows the posting of the contact person name and address in the list of the directories. If you check no then only the Organization Name will be viewable by the public. The "Receive Email Directory Change Notifications" radio button enables/disables receiving of emails when any of the directory addresses are modified (added/updated/deleted). The emails are sent to the email address specified on this form. When you make a change and click on the Save Changes button, the changes are done immediately. 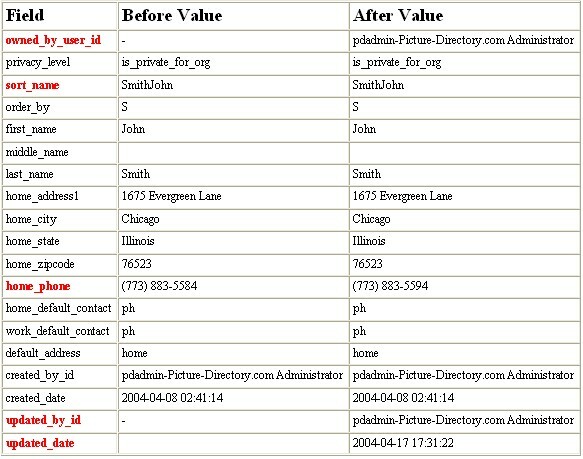 The directory privacy levels for your data are completely independent of the organization privacy radio buttons. The Update My Organization Screen also shows you the number of users, addresses, events, pictures, and disk space that you are using and maximums allowed. The maximum allowed number vary from one organization to the next depending on the particular subscription plan the organization has signed up for.